I’ve often wondered why the USA took such a close in interest in a place as small as Northern Ireland. We are half the size of Hawaii with around the same population or the size of Connecticut with half the population. We have no resources that could interest the Americans. The other unusual aspect is that we are a de facto part of the United Kingdom, a close ally of the US. Leaving aside the many criticisms of the UK’s historic governance of Ireland, the UK is not held to be some ‘banana republic’, unable to govern its territory, necessitating larger states like the US to intervene. Some argue that the reason for US interest is purely strategic. Ireland is historically seen as the back door into Britain and western Europe. But a ‘backdoor’ for who? When the US first became publicly engaged with the Irish situation under President Bill Clinton in the nineties the Soviet Union had collapsed and posed only a threat to themselves and no one else. Germany was an ally and Al Queda/ ISIS had yet to be created. So where was the threat coming from? I assumed that given our size and minor role in the world that those US representatives being sent here as ‘envoys’, such as George Mitchell and Richard Haass, were junior diplomats. However that is far from the truth and this is where the plot thickens. All those US envoys sent to Northern Ireland are very senior diplomats. It would be hard to get more senior. But beyond their rank they all have an intriguing element in common and it’s not membership of the Free Masons. They are all members of an elite and extremely powerful US political think known as the Council on Foreign Relations (CFR). Founded in 1921 and based in New York, membership of the CFR is a who’s who of senior US politicians (including former presidents), bankers, corporate CEOs, academics and media bosses. The CFR is not just one of many political think tanks in the US, it is THE think tank and it does a lot more than just think. According to Richard Harwood, former Managing Editor of the Washington Post, the CFR is the ‘ruling establishment of the United States.’ Through its membership the CFR controls the media, banking and the enormous military- industrial complex in the US and consequently in many parts of the world. Imperial Council of the Council on Foreign Relations – the ‘Deep State’. German news magazine Der Spiegel once described the CFR as the “most influential private institution of the United States and the Western world“ and a “politburo of capitalism”. Both the Roman-inspired logo of the Council (top right in the illustration above) as well as its slogan (ubique – omnipresent) appear to emphasize that ambition. 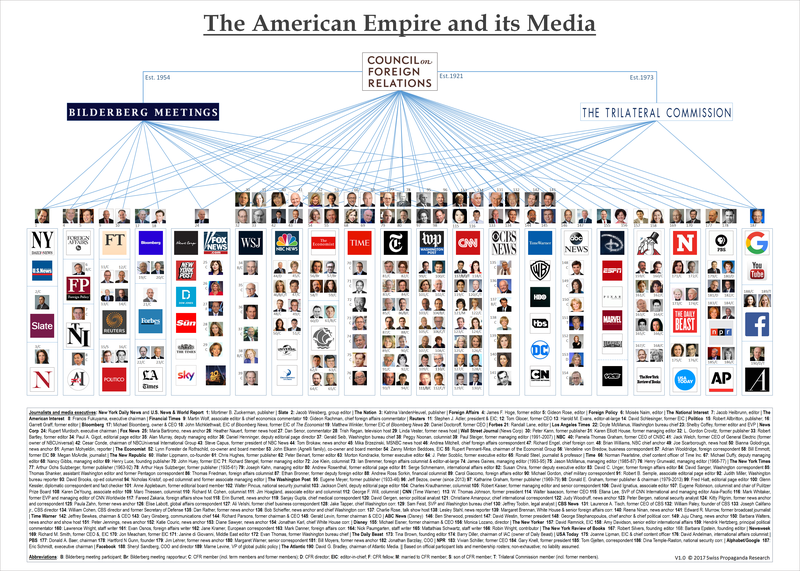 The Swiss Propaganda Research center has released information showing that the CFR controls the American media through six companies that now own most of the western media – Comcast, Disney, News Corp, Viacom, Time Warner and CBS. All those Americans involved in Northern Ireland are members of the CFR – from Bill and Hillary Clinton to George Mitchell, Richard Haass (Haass has been President of the CFR since 2003), Mitchell Reiss and Gary Hart. So the question is why do people with this pedigree interest themselves in a place as small as Northern Ireland, when they have so many, much more important and pressing global issues on their desks? It is impossible to answer this question with any certainty: except to say that it beggars belief to accept the public position of the US that it is simple philanthropy. Why would Americans be philanthropists in Northern Ireland and violent aggressors in most other areas of the world? Let’s not pretend it’s their ubiquitous Irish ancestry making these hard-headed American capitalists all dewy-eyed for the ‘oul’ country’. And have they got bored with us since they have allowed their creation – the Good Friday Agreement – to be destroyed? Have we been and are we still a giant laboratory for some social and political engineering experiment for the American and British Deep State?